Calvin Harris has taken to Instagram to explain what he believes to be the definition of the much-debated term, “EDM”. Upon sharing a picture of himself and Tiësto DJing together at his residential club OMNIA, Las Vegas, Harris rhetorically asked, “What is happening in the second pic?”. 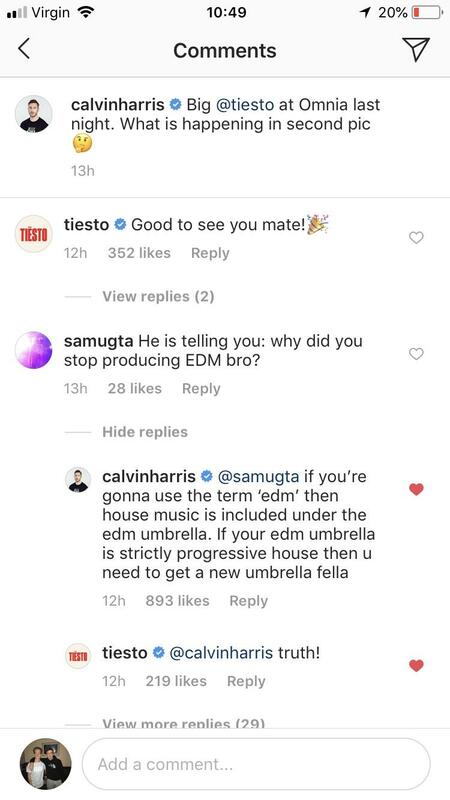 When a fan subsequently replied saying that Tiesto was asking the Scottish superstar why he had stopped producing EDM (“He is telling you: why did you stop producing EDM bro?”) the highest paid DJ in the world decided he would put user Samutga in his place. Tiësto, the third highest paid DJ in the world, decided to back his pal up against the unruly fan, simply replying, “Truth!”. You can take a look at the exchange below along with the picture that caused the debate in the first place. The contentious conversation of how we define “EDM” is something that DJ Mag’s digital editor Charlotte Lucy Cijffers explored at length recently, asking the dance music world, “Can we please stop calling all dance music genres ‘EDM’?”. If Calvin Harris and Tiësto have their way, however, it will be a while before that happens.